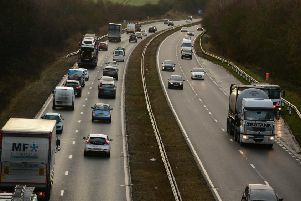 Motorists trying to get home via Houghton Cut are facing delays due to the wintry conditions. The North East Combined Authority shared images on its Twitter account, @NELiveTraffic, of vehicles building up on the route, which was closed by police earlier today after a number of cars became stuck. The severe weather, which is expected to continue over the weekend with a further Yellow weather warning issued by the Met Office, has led to delays across the region today. In a series of Tweets, the Combined Authority said: “Conditions on the A690 northbound at Houghton Cut have deteriorated and traffic is moving very slowly with some vehicle being stuck. Motorists stopped on Houghton Cut.